The rose window was originally installed in St. Paul’s Memorial Chapel on Lancaster Street, and dedicated on March 29, 1942 by G. Ashton Oldham, bishop of the Episcopal Diocese of Albany. It was given in memory of Randall J. LeBoeuf, St. Paul’s vestryman from 1914 to 1930, and warden from 1930 until his death in 1939. LeBoeuf (born 1870) was an attorney specializing in banking and corporate law, the founder of the Albany Trust Company (later First Trust Company) and a justice of the New York Supreme Court. A small miracle that the glass arrived safely, and that on a Christmas Day almost seventy-five years later it still graces our chapel! This entry was posted in Christmas, Hackett Blvd Building, Lancaster Street Building, Windows on December 25, 2016 by Paul Nance. 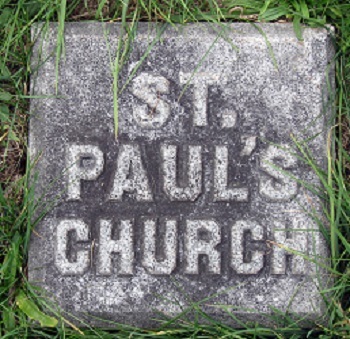 St. Paul’s was originally founded in Albany’s South End. While we chose to leave that neighborhood in 1839, we established an important presence there thirty years later, when we created our Free Mission Chapel on Madison Avenue in 1867. This post discusses the intertwined reasons why St. Paul’s chose the Madison Avenue location for its Chapel, and why, after fourteen successful years, we chose to leave. The first home of “St. Paul’s Church or Congregation in the City of Albany” was at what is now the corner of South Ferry Street and Dongan Avenue. The parish was organized as an outreach to that rapidly growing part of the city, and most of the early congregation was drawn from the neighborhood. Purchase of the property and construction of the building were too great a burden for the congregation. By 1830, only a year after the building was completed, debt and mounting interest payments were already threatening to overwhelm the young congregation. The parish struggled along on South Ferry Street until 1839, when creditors forced the vestry to sell the building. The leadership of St. Paul’s decided to leave the neighborhood and to modify a theater on Pearl Street as their church home, starting what they called “a new venture” in the center of Albany. The decision to abandon the South End was not unanimous: a number of St. Paul’s families, including those of two vestry members, started a different “new venture.” Choosing to remain in the neighborhood, they formed a parish and named it Trinity Church. The new congregation was not strong or wealthy in its early years, but by 1848 they were able to build a handsome building on what is now Trinity Place, where they remained until they were closed in about 1980. As the only Episcopal congregation in Abany’s South End, Trinity will play a role as our story progresses. St. Paul’s stayed at the former Pearl Street Theater for twenty-three years, only leaving in 1862 after what had been an upscale residential neighborhood became Albany’s business district. We moved to our third home on Lancaster Street, a structure originally built as the Dudley Memorial Reformed Church. Five years after moving to Lancaster Street, St. Paul’s decided to establish a mission chapel. Vestry minutes record the purchase on December 20, 1867 of the former fire house on the south side of Madison Avenue, just east of Green Street, for a cash deposit of $1,500 and a mortgage totaling $2,366.16 “on behalf of the Missionary Society of the Church.”[i] The rector at the time says that this was “in response to an earnest desire to enter upon some mission work in the city.”[ii] But what were the Mission’s purposes and what were the reasons for the timing of purchase and the location selected? The chapel’s name suggests the purposes for this new outreach: it was called a Free Mission Chapel. Like the Chapel of the Holy Innocents, this was to be a free chapel, meaning that seating was open to all, without the requirement to pay pew rents, the most common method of financial support for churches at that time. And it was to be a mission chapel, serving the underserved: the unchurched, the poor, recent immigrants. Importantly, it would also be a home for the deaf ministry, which had been active at St. Paul’s since early in that decade. In addition to being close to the city center, the Madison Avenue location had another advantage: it was only four blocks from the site of the first St. Paul’s on Ferry Street. Our vestry may have hoped to reestablish our presence in the neighborhood in which we had been born, encouraging the return of those who had fallen away after St. Paul’s left the South End , and perhaps even attracting those who were attending Trinity Church. From the beginning, St. Paul’s supported the majority of the mission’s expenses by voluntary contributions. In 1870, in declining to pay a diocesan assessment of $600 for missions, the vestry reported supporting the Mission at a cost of about $2,500 annually, as well as being “the sole supporter of the Mission for Deaf Mutes in this section of the state.”[v] The Mission’s priest-in-charge was St. Paul’s assistant rector, whose salary was also paid by St. Paul’s contributions. The little chapel must have been a very busy place. By the late 1870s, the original schedule of morning and evening Sunday services had been expanded with an afternoon Sunday School, Tuesday and Friday choir rehearsals and a Friday evening service, with another choir rehearsal following, as well as the evening classes and services for the deaf. As a sign of the importance of the deaf ministry in the Chapel’s life, its priest-in-charge from 1872 until 1874 was Thomas B. Berry, who before his ordination had taught in schools for the deaf in England, New York City and Frederick, Maryland. During his term as the Chapel’s pastor, Berry also assisted Thomas Gallaudet in work of Church Mission for Deaf Mutes around the state. In 1879, a very active Young People’s Association had a full slate of officers and many activities (they were mainstays of the chapel choir), including a short-lived publication, “The Chapel Monitor.” A Guild of Purity and Truth for girls attracted a good many postulants (ages 10 to 12) and members (over age 12). So it was that the Mission congregation was merged into the parish that had split off from St. Paul’s in 1839. The South End was better served by a parish strengthened by the Mission’s congregation and one dedicated to that part of the city. In the early twentieth century Trinity, under the leadership of Creighton Storey, created the Trinity Institute, which more than a century later (now as Trinity Alliance) is still providing social services for the South End. [i] St. Paul’s Vestry Minutes, Volume 2, 19 Dec 1867 and 27 Jan 1868. [ii] J. Livingston Reese “Historical Sketch of St. Paul’s Parish,” in The Semi-centennial Services of St. Paul’s Church, Albany, N.Y. (Albany: The Argus Company, 1877), 16. [iii] Albany Argus, 31 Dec 1867. [iv] Albany Morning Express, 25 Jul 1872. [v] St. Paul’s Vestry Minutes, Volume 2, 11 Feb 1870. [vi] Albany Morning Express, 7 Nov 1874. [vii] “St. Paul’s Mission Chapel 1882” and “St. Paul’s Mission Chapel 1883” in St. Paul’s archives. [viii] George E. DeMille, A History of the Diocese of Albany 1704-1923 (Philadelphia: The Church Historical Society, 1946), 126. The transfer of deed from St. Paul’s to Frank A. Haviland is recorded in Albany County Clerk Deed Book 361, page 193, dated 14 Oct 1884 and entered 30 Oct 1884. [ix] Albany Morning Express, 31 Dec 1892, 5. This entry was posted in Deaf Ministry, Free Chapels on December 8, 2016 by Paul Nance.